Behind the scenes of the internet, there is a war going on between web browsers that has helped improve the internet experience for everyone. Gone are the days of Netscape vs. Internet Explorer. Today, there are many new players and a few very innovative companies that are leading the way. As far as internet surfing is concerned, there are a lot of browsing features to consider, but only a few that really make a difference. Here they are starting with the most important. 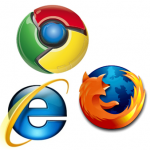 Based on the features that matter the most to the majority of internet users, here are my favorites browsers starting with the best. Chrome from Google is a relatively new browser, debuted by Google a little more than a year ago. Google decided to rethink the entire internet experience and build a browser from the ground up. They threw out some features that people assumed were necessary, and then optimized the engine behind the browser to make it super fast. The only downside may be less features than other browsers that have been around much longer. Here are some of Chrome’s features. Firefox from Mozilla has recently fallen from my favorite browser spot to 2nd. For a long time running, Firefox provided innovative features that Internet Explorer lacked like tabbed browsing and speed, but as some of those features have become mainstream Firefox as sputtered to stay in the lead and has even become a little bloated. Here are some of Firefox’s key features. Microsoft held the only commonly used browser for years after Netscape died out. For a long time, we didn’t know what we were missing until Firefox and Chrome showed us the way. Today, Microsoft is rebuilding IE to compete when the up and coming challengers and is starting to do alright at it. The latest iteration of Internet Explorer is IE8 and here are its key features. Close behind the leaders are a few other browsers that may potentially compete for the mainstream attention of my top three. Opera is a browser more popular in the techy world and commonly used in personal devices. It has been fighting for a while and developing new features that we eventually hear about when they reach the top browsers. Safari is a browser from Apple Inc. that hasn’t quite caught on in the PC world yet due to compatibility issues, but it stands a chance considering that it is packaged with iTunes on most computers. Got any suggestions about browsers or questions? Comment below. Previous PostHow to Save for Retirement if Finance is Not Your LifeNext Post$10 iTunes Giveaway! I tried Chrome a few months ago and it was pretty good, but Firefox has so many useful plugins that I find it hard to beat. Since Chrome is relatively new it can’t really compete with Firefox regarding plugins, but I could see Chrome becoming a stronger competitor to Firefox in the future. Great point @Adam . We’ll see if Chrome can catch up with Firefox in the PlugIn category. That could really separate it from the bunch. For almost all basic browsing I prefer Chrome as the speed is a huge advantage. However, the biggest drawback to Chrome from my experience is that it has very bad speed problems when trying to resolve a proxy over secure connections- a [guesstimated) 15% speed gain in basic browsing is more than offset in these instances by taking 4-5x longer to resolve the proxy. I wish they would address this issue and then I would wholeheartedly support it. As such, I prefer Firefox for all general usage. I tried them all but am forced to go back to IE8, not my favorite but the only one I can run all my Real Estate programs on! Frustrating for sure! @Justin, wow, great point on Chrome. I haven’t even thought about those secure connections, but I think I’ll do some tests and see what I notice. Hopefully Chrome will solve the issue to provide a better all around experience. @Traci, yea I hate when so many businesses are set up only to run on IE. That’s the only reason IE has stuck around. Hopefully IT will get with the game soon and let us use Firefox and Chrome at times. My work is still stuck on IE6. I prefer Chrome but got frustrated by the number of sites that didn’t support it. As it becomes more mainstream, I’ll make the switch again. Thanks for your input. That seems to be the common theme here. Good thing is that it’s much better than when it first came out, but still has a way to go to be as commonly accepted as Firefox and IE. I used safari for years, but recently went to firefox. I tried chrome on windows and did not care much for it at all. IE is among the worst in my view… I don’t understand why so many windows users swear by it.